Iran test fired a long range missile capable of reaching Israel and U.S. troops in the region. The regime reportedly fired off 9 missiles. But, it wasn’t this missile that was pictured on the Iranian Republic News website. This missile was fired off sometime before October 2007. Defense Secretary Robert Gates said Iran’s missile test bolsters the U.S. argument that Tehran is a threat –Breitbart. UPDATE: Iranian blogger Kamangir has more bogus shots. UPDATE 2: Charles Johnson says today’s photos were photoshopped. 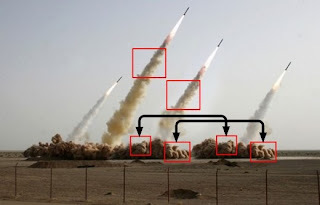 The Iranian rocket photos were not just dated but they were photoshopped.